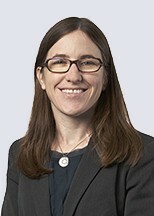 Amanda Wolfman is a partner in the Complex Commercial Litigation Practice Group. She focuses her practice on solving her clients' legal and business problems, whether through litigation or settlement or another creative solution. She represents plaintiffs and defendants in a broad range of complex commercial matters before state and federal courts and arbitral tribunals. In particular, Amanda is experienced in real estate disputes and professional liability litigation. She handles cases throughout the various stages of litigation, from pre-litigation counseling and settlement through appeals.